Arriva Trains Wales (Welsh: Trenau Arriva Cymru) (ATW) is a British train operating company operating the Wales & Borders franchise. 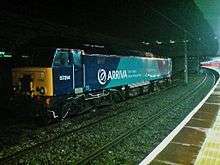 It is a subsidiary of Arriva UK Trains, itself a subsidiary of Deutsche Bahn. It runs urban and inter-urban passenger services to all railway stations in Wales, including Cardiff Central, Cardiff Queen Street, Newport, Swansea, Wrexham General and Holyhead, as well as to certain stations in England such as Hereford, Shrewsbury, Chester, Manchester Piccadilly and Birmingham New Street. In March 2000 the UK government announced plans to create a separate Wales & Borders franchise. In October 2001 the two National Express-operated franchises, Valley Lines and Wales & West, were reorganised, with Wales & Borders taking responsibility for most services in Wales as shown on its map. The services from Birmingham New Street to Chester, Aberystwyth, and Pwllheli operated by Central Trains were also transferred. On 1 August 2003 the Strategic Rail Authority awarded Arriva the new franchise. 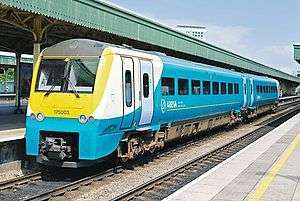 The new franchise was for fifteen years, with performance reviews every five years; Arriva Trains Wales took over the services operated by Wales & Borders on 7 December 2003. The next five-yearly review period concluded on 31 March 2013. On 28 September 2003 the services from Birmingham New Street, Crewe and Manchester Piccadilly to Llandudno and Holyhead as well as those between Bidston and Wrexham Central and between Llandudno and Blaenau Ffestiniog, operated by First North Western, were transferred to the new Wales & Borders franchise. Responsibility for the franchise was later devolved to the Welsh Government as a result of the Railways Act 2005 and the Transport (Wales) Act 2006, and it works closely with Arriva Trains Wales to develop the railway network within Wales. This has included the introduction of direct services between North and South Wales, and the reintroduction of passenger services on previously freight-only portions of the Vale of Glamorgan Line and Ebbw Vale Line. ATW operates over a route length of 1691 km, with 253 DMU cars and 22 locomotive-hauled passenger carriages. Its busiest Welsh stations are Cardiff Central, Cardiff Queen Street and Newport in South Wales, and Bangor (Gwynedd) and Wrexham General in North Wales. In October 2006, ATW was ranked seventh best (out of 21 companies) with an above average 89.9% of trains 'on time' according to Network Rail statistics. The latest figures released by NR (Network Rail) rate punctuality (Public Performance Measure) at 96.1% for period 7 of the 2013/14 financial year. The MAA (Monthly Annual Average) figure for the 366 days up to 12 October 2013 is currently at 93.9%. The Welsh Language Act 1993 requires all public bodies to provide services to the public through the medium of Welsh as well as English. As a private company and not a public body, Arriva is not legally required to provide service in Welsh, but it does conduct some business in Welsh. All stations in Wales where the Welsh and English names differ have both names displayed, with a few minor omissions. ATW does not display Welsh names in the English stations which it manages, such as Chester (Welsh: Caer) or Hereford (Welsh: Henffordd), but includes the Welsh names in its printed timetables and other publicity material. There are bilingual signs at Hereford, for example, warning against trespassing on the railway. Arriva Trains Wales has introduced bilingual display screens and announcements in at least 46 stations. In 2004, ATW introduced a Welsh-language telephone line. Its website was named the "Best Website of The Year in the Technology Wales Awards 2004". Route 1 services are express/stopping services between the Midlands and North/Mid Wales. Route 2 services are mainline long-distance services between South Wales and North Wales/Manchester. Route 3 services are express/stopping services along the South Wales Coast Line to Cardiff and Swansea. Route 4 services are express/stopping services along the North Wales Coast Line to Crewe and Manchester. Route 5 is a network of commuter lines operating in and around Cardiff. 1 Birmingham International to Shrewsbury, Aberystwyth, Pwllheli, Chester and Holyhead; The Heart of Wales Line Principal stations served by all trains are Birmingham International, Birmingham New Street, Smethwick Galton Bridge, Wolverhampton, Telford Central, Wellington and Shrewsbury. Trains then continue from Shrewsbury with 1tp2h extending to Holyhead via Wrexham General and Chester, and 1tp2h to Aberystwyth and Pwllheli. The Heart of Wales Line runs from Craven Arms to Swansea, although most southbound services originate from Shrewsbury and some extend from Swansea to Cardiff Central. Cambrian Line uses Class 158 DMUs. Heart of Wales line usually uses Class 153 or Class 150 DMUs, though Class 175 DMUs have been used on rare occasions. 2 Swansea/Llanelli/Cardiff Central to Holyhead, Carmarthen, Pembroke Dock, Milford Haven, Fishguard Harbour and Manchester Piccadilly, Crewe Principal Stations served by all trains are Cardiff Central, Newport, Abergavenny, Hereford, Ludlow and Shrewsbury. All mainline services in South Wales, serving Newport, Cardiff, Swansea, Carmarthen, Pembroke, Fishguard and Milford Haven. Trains then continue from Shrewsbury with 1tp2h extending to Holyhead via Wrexham General and Chester, and 1tph continue to Manchester Piccadilly via Crewe, Wilmslow and Stockport. Class 175 DMUs are used. Class 158 DMUs are used when Class 175 DMUs are not available. 3 Cardiff to Swansea, Carmarthen, Pembroke Dock, Milford Haven, Fishguard Harbour and Ebbw Vale; Maesteg to Cheltenham Spa, Gloucester All express and local services in South Wales, serving Newport, Cardiff, Swansea, Carmarthen, Pembroke, Fishguard, Milford Haven, Ebbw Vale and Maesteg. Class 150, Class 153, Class 158 and Class 175 DMUs are used. 4 Holyhead to Manchester, Chester and Crewe; Llandudno to Warrington Bank Quay and Manchester Piccadilly/Manchester Airport; The Conwy Valley Line; The Borderlands Line Holyhead, Bangor, Llandudno, Llandudno Junction, Colwyn Bay, Rhyl, Prestatyn, Flint, Shotton, Chester and then on to Crewe or Manchester Piccadilly/Manchester Airport via Warrington Bank Quay. The Borderlands Line runs from Wrexham Central to Bidston, where passengers can change for Merseyrail services to Birkenhead and Liverpool Lime Street. The Conwy Valley Line runs from Llandudno through Snowdonia National Park, terminating at Blaenau Ffestiniog. Services to Crewe and Manchester use Class 175 DMUs. Class 158 or Class 150 DMUs are used when Class 175 DMUs are unavailable. Borderlands Line and Conwy Valley Line services use Class 150 DMUs. 5 Valleys & Cardiff Local Routes Trains operate out of Cardiff Central and Cardiff Queen Street providing commuter services, incorporating several lines, Butetown Branch Line between Queen Street and Cardiff Bay, Cardiff City Line to Radyr, Coryton Line, Vale of Glamorgan Line to Bridgend, Merthyr Line to both Merthyr Tydfil and Aberdare, Rhondda Line to Treherbert and the Rhymney Line to Rhymney. Class 150, Class 143 and Class 142 DMUs are used. Services along the North Wales Coast Line terminate at Holyhead and Llandudno. Llandudno services run every hour to Manchester Piccadilly via Chester and Warrington Bank Quay. Holyhead services run every hour, to Shrewsbury via Chester and Wrexham General, then alternately to Birmingham International or Cardiff Central. Request stations west of Llandudno Junction (Conwy, Penmaenmawr, Llanfairfechan, Llanfairpwll, Bodorgan, Ty Croes, Rhosneigr and Valley) are generally served by alternate trains. The Conwy Valley Line is operated by a single train running between Llandudno and Blaenau Ffestiniog, with six return journeys a day. The private Ffestiniog Railway operates connecting services between Blaenau Ffestiniog and Minffordd near Porthmadog. Services on the Borderlands Line run from Wrexham Central to Bidston on the Wirral Peninsula, crossing the North Wales Coast Line at Shotton. This line connects with main-line services at Wrexham General; with North Wales Coast line services at Shotton; and with electrified lines operated by Merseyrail at Bidston. It may be converted to electric operation in the future. Cambrian Line services consist of trains from Aberystwyth to Shrewsbury, Birmingham New Street and Birmingham International every two hours. Services from Pwllheli join this train at Dovey Junction or Machynlleth. Services are operated exclusively by Class 158 Express Sprinters, as they are the only units fitted with the necessary equipment for the ERTMS system used on the line. The single-track nature of this line, coupled with the busy terminus at Birmingham New Street, meant that delays could result in partial cancellation of services on this line. From December 2008, most services have been extended to the less busy Birmingham International station, giving more flexibility in making up any lost time; this was also intended to help international students at Aberystwyth University gain easier access to an airport. The Heart of Wales Line has services from Swansea to Shrewsbury via Llanelli and Llandrindod four or five times a day. It is marketed by Arriva Trains Wales as a scenic, rural line, with special rover tickets available. As of September 2008, ATW operates an hourly long-distance service from Carmarthen to Manchester Piccadilly via Cardiff Central and the Welsh Marches Line. Some off-peak services terminate at or originate from Cardiff Central, and continue to or come from Milford Haven every two hours. ATW also operates a service every two hours from Cardiff Central to Holyhead via Wrexham General. Other branches of the West Wales Line as served by trains from Swansea and Cardiff Central. Trains operate a shuttle service between Swansea and Cardiff Central (known as Swanline), calling at more minor stations than the Great Western Railway InterCity services do. ATW also operates the Heart of Wales line between Shrewsbury and Swansea via Llandrindod, with four trains per day in each direction. Special trains extending into South East Wales operate to Builth Road during the Royal Welsh Show annually in July. The Valley Lines network, previously operated as a separate franchise, is a collection of urban lines in Cardiff and the surrounding area, including the South Wales Valleys and the Vale of Glamorgan. Arriva Trains Wales also operates a service from Maesteg to Cheltenham Spa. Stations in the valleys north of Cardiff have experienced strong passenger growth, as a result of which there is now a half-hourly service on the fringes of the network (Pontypridd-Treherbert, Abercynon-Aberdare, Abercynon-Merthyr Tydfil and in the future Bargoed to Rhymney). Service frequency growth at the fringes is a significant problem because of often lengthy single-track sections. Between the larger towns and Cardiff, these services combine to provide at least a train every 15 minutes, with six trains per hour between Pontypridd and Cardiff, and four trains per hour between Bargoed and Cardiff. Stations on the Treherbert and Rhymney branch lines have been lengthened to accommodate six-car trains to cope with future growth demand for commuting into and out of the capital. On 6 February 2008, the Ebbw Valley Railway was partially re-opened to passenger services for the first time in over 40 years. It provides an hourly service from Ebbw Vale Town railway station (opened 17 May 2015) to Cardiff Central calling at Ebbw Vale Parkway, Llanhilleth, Newbridge, Crosskeys, Risca and Pontymister, and Rogerstone and Cardiff Central. One year after opening, the line had carried 573,442 passengers, beating all targets set by the Welsh Assembly Government. Saturday trains run as four-car formations instead of the standard two. Extra carriages are also added during school holidays when demand is high. Possible developments on the line also include restoring the service between Ebbw Vale and Newport; the proposal awaits Network Rail and Welsh Government approval. If implemented it would provide an hourly service between Newport and Ebbw Vale. In July 2012 the Department for Transport announced that the Cardiff Valley Lines would be electrified, although no timescale has been given. This will entail replacement of the life-expired Pacer railbuses by new or cascaded stock. Services between Chester and Newport form part of other ATW services already mentioned, such as Holyhead to Cardiff Central, or Milford Haven to Manchester Piccadilly. Coming north, after calling at Shrewsbury (for connections to Mid-Wales), trains for North Wales go to Chester via Wrexham General, and trains for Manchester go to Crewe. A weekday Premier Service between Holyhead and Cardiff was introduced on 15 December 2008. This is run under contract to the Welsh Government. Wrexham & Shropshire and Grand Central expressed an interest in operating the service, but the contract was awarded to Arriva Trains Wales. At the time of the launch it was known as Y Gerallt Gymro (Gerald of Wales) but today it is referred to as the Premier Service. It departs Holyhead at 05:30, returning from Cardiff at 17:16. It features first-class accommodation and a full dining car with travelling chef. Normal standard-class fares are valid on the train. First class attracts a supplement and includes a complementary breakfast on the morning service and a three-course meal on the evening service. This is the only ATW service to offer first-class accommodation. It originally ran via Crewe but from September 2012 was rerouted via Wrexham, requiring the train to change direction at Chester in addition to having its evening departure moved from 16:15. In December 2014, the Premier Service was renamed to be the Business Class Service in an attempt by Arriva Trains Wales to make the service more appealing to those travelling to and from Cardiff to work. Ticket prices remain the same and are still sold as first class, and the restaurant service remains although tablecloths and antimacassars have been removed to promote a more work-like environment. There is also a Premier Service on the North Wales Coast Line, running between Crewe, Manchester, Chester, Llandudno and Holyhead. For special events such as football or rugby matches, ATW operates additional services to the venue. Wales & Borders had arranged in the past a stopping service to Edinburgh Waverley. Numerous other services have been operated. ATW usually operates shuttle services to Newport on match days. When rugby international matches are held at the Millennium Stadium, ATW often runs an extra Holyhead to Cardiff service using the Premier Service rolling stock. In April 2015, ATW were highly criticised and issued an apology for their continual poor performance when dealing with the Judgement Day rugby matches at the Millennium Stadium. Passengers were left queuing for hours due to the lack of services and lack of carriages available, some had to abandon their journeys for other means such as taxi and van hire. A spokesman for the company said “I want to assure all customers that every single train in Wales was out [on Saturday].” He added that the event differed to international rugby events, because the majority of those travelling to the matches travelled from south and south west Wales, placing huge pressure on specific routes. Arriva Trains Wales used to operate services from Manchester Piccadilly, Pembroke Dock, Carmarthen and Swansea to London Waterloo, Brighton, Portsmouth Harbour, Plymouth and Penzance via Cardiff, Bristol and Westbury. Services south of Cardiff are now operated by Great Western Railway, while a Bristol Temple Meads to Waterloo service is provided by South West Trains. ATW applied to reinstate a direct Aberystwyth to London service serving all stations to Birmingham International and additionally calling at Leamington Spa and Bicester North on its way to London Marylebone. Two off-peak trains would have operated each day, while a further service would have been added on Saturdays in high summer. Rolling stock would have been Class 158 Sprinters. There were worries that, if Arriva Trains Wales were granted this service, it would push Wrexham – London operator Wrexham & Shropshire out of business, with Wrexham & Shropshire Managing Director, Andy Hamilton, saying "We believe that this proposal – if approved – would push the date of profitability of WSMR by at least a year. As a result of this our owning group would be unable to sustain additional and continuing losses and the WSMR service would cease to exist." The application was rejected by the Office of Rail Regulation in March 2010 due to concerns about the financial viability of the service and the potentially high level of revenue abstraction from other operators. Wrexham & Shropshire ceased to operate a year later. Arriva Trains Wales services are operated by diesel trains only, as there are currently no electrified railway lines in Wales. As of March 2008, Arriva Trains Wales operates a fleet of 123 diesel multiple units. It also owns some Mark 3 coaching stock, used for locomotive-hauled express services between Holyhead and Cardiff, and has occasionally used hired-in locomotives to run extra services for sporting events. ATW inherited a fleet of Class 142, Class 143, Class 150, Class 153, Class 158 and Class 175s from Wales & Borders. The Class 175s were a common user fleet with 11 required by First TransPennine Express each day. In the early years of the franchise, ATW operated locomotive-hauled services using Mark 2 carriages on services from Cardiff Central to Rhymney and Fishguard Harbour hauled by English Welsh & Scottish Class 37s and FiftyFund Class 50s, and from Crewe and Manchester Piccadilly to Holyhead hauled by Freightliner Class 47s and Virgin Trains Class 57s. ATW built up a fleet of 20 Mark 2 carriages to operate these; all had been withdrawn by 2007, most of them being stored at Long Marston. ATW received 12 Class 150s cascaded from First ScotRail and another from One in 2004/05. In December 2006 another eight were transferred from First Great Western, notionally to provide stock for the Borderlands Line and Ebbw Valley Railway services. Following the delivery of new stock to First TransPennine Express in 2006, all of the Class 175s becoming available to ATW, resulting in 16 Class 158s being released for transfer to other operators. In 2006 heritage unit 121032 was purchased by ATW for use on the Cardiff Bay Shuttle. The unit was overhauled by LNWR, Crewe, entering service with ATW on 17 August 2006. In 2013, the unit suffered an engine failure. This could not be rectified, meaning that the unit was withdrawn. It is now used as a source of spare parts by sister company Chiltern Railways. In November 2007 another nine Class 150s were transferred from Central Trains. From February 2008 five Class 150s (150278-282) were subleased to First Great Western. This was later reduced to four and then two, the last returning in 2011. In December 2008 the loco-hauled Holyhead to Cardiff Premier Service was inaugurated. It was hauled by Class 57s on hire from Virgin Trains, initially in top-and-tail formation and later singularly, hauling three standard class Mark 2s and a Mark 3 first/buffet. Four Class 57s were repainted at Cardiff Canton and six Mark 2s were refreshed at Eastleigh Works. Class 67s took over from the Class 57s in March 2012, and Mark 3s refurbished by Pullman Rail from the Mark 2s in October 2012. From October 2011 until August 2012, 150280 was subleased to National Express East Anglia/Greater Anglia. In December 2014, a further Mark 3 set will be introduced on services from Manchester Piccadilly-Holyhead or Llandudno. All units are currently being refurbished in the new arriva moquette and the new two tone, dark WAG livery. ATW's Class 142, Class 143, Class 150, Class 153 and Mark 3 fleets are maintained at Cardiff Canton. The Class 158s are maintained at Machynlleth and the Class 175s at Chester, under contract to Alstom. The Invitation to Tender for the next franchise will be issued in August 2017, with the contract awarded in June 2018 and the new franchise starting in October 2018. In October 2016, Abellio, Arriva, Keolis/Amey and MTR Corporation were shortlsted to bid. ↑ "Our Company". Arriva Trains Wales. Retrieved 11 August 2015. ↑ "Route map" (PDF). Wales & Borders. Archived from the original (PDF) on 14 June 2003. ↑ "More than just a new name for Wales & West in Wales". Wales & Borders. Archived from the original on 21 October 2001. ↑ "SRA Announces Preferred Bidder for New Integrated Wales Franchise" (Press release). Strategic Rail Authority. 1 August 2003. ↑ "Passenger Franchise Information: Arriva Trains Wales". ATOC. 2008. Archived from the original on 5 March 2008. ↑ Rail Franchising Timetable. Department for Transport. 1 July 2012. ↑ "Transport: Rail". Welsh Government. 3 October 2012. Retrieved 24 October 2012. ↑ Hulme, Chris. "North Wales Railway Notice Board – That new Arriva Timetable". Archived from the original on 14 October 2007. Retrieved 26 March 2008. ↑ Public Performance Measure. Network Rail. 1 2 "Rail performance results period 7". Network Rail. 1 2 Clark, Rhodri (5 January 2005). "Train firm's web site hits the buffers over Welsh language". Western Mail. Cardiff. Retrieved 15 April 2008. ↑ "Welsh signs would be on wrong track". Hereford Times. 8 January 2004. Retrieved 20 October 2013. 1 2 "Rail company launches Welsh language phone line" (Press release). Arriva Trains Wales. 10 June 2004. Retrieved 23 June 2013. ↑ "Arriva Trains Wales secures top internet communications award" (Press release). Imaginet. 28 May 2004. Retrieved 20 October 2013. ↑ Timetables. Arriva Trains Wales. ↑ "Provisional North Wales Regional Transport Plan (Appendix 2- Railway Development in North Wales" (PDF). Retrieved 20 October 2013. ↑ 2008 timetable alteration summary. ↑ "The Heart of Wales Line". Arriva Trains Wales. Retrieved 20 October 2013. ↑ "Discover Wales and the Borders by Train – Your Guide to Arriva Trains Wales' Rovers and Rangers". Arriva Trains Wales. Retrieved 25 August 2008. ↑ "Ebbw Valley rail link marks first successful year". South Wales Argus. Newport. 10 February 2009. Archived from the original on 13 February 2009. Retrieved 24 March 2009. ↑ "Rail electrification to Swansea and south Wales valleys". BBC News. 16 July 2012. 1 2 3 4 Clark, Rhodri (15 December 2008). "Cost of subsidised rail service a secret". Western Mail. Cardiff. Retrieved 20 October 2013. ↑ Clark, Rhodri (26 April 2008). "Trains carry true taste of Wales". Western Mail. Cardiff. Retrieved 20 October 2013. ↑ "North-South Wales Premier Service". Arriva Trains Wales. Retrieved 20 October 2013. ↑ "All Change for the Premier Service". North Wales Coast Railway Notice Board. 20 September 2012. ↑ "First class to be retained on controversial North to South Wales train after U-turn". Daily Post. Retrieved 24 January 2016. ↑ "Train company apologises after rugby fans left fuming over Judgement Day services". ↑ "Arriva Trains Wales Announces Plans for Direct Aberystwyth – London Services" (PDF). Railtalk Magazine. January 2009. p. 50. Retrieved 24 October 2012. ↑ "DB Regio to cease funding WSMR if Arriva runs in to London". Rail (630). Peterborough. 4 November 2009. ↑ "Aberystwyth to London direct rail route rejected". BBC News. 1 March 2010. Retrieved 1 March 2010. ↑ "Wrexham-Shropshire-London direct rail link to end". BBC News. 26 January 2011. ↑ Rail (Peterborough) Issue 562. 28 March 2007. p. 45. ↑ Rail (Peterborough). Issue 573. 29 August 2007. p. 62. ↑ "DfT Rail Franchise Schedule" (PDF).